Zao Jun the Kitchen God to whom Wǔgǔ offerings are made in some traditions. The Five Grains or Cereals (Chinese: t 五穀, s 五谷, p Wǔ Gǔ) are a grouping (or set of groupings) of 5 farmed crops that were all important in ancient China. Sometimes the crops themselves were regarded as sacred; other times, their cultivation was regarded as a sacred boon from a mythological or supernatural source. More generally, wǔgǔ can be employed in Chinese as a synecdoche referring to all grains or staple crops of which the end produce is of a granular nature. 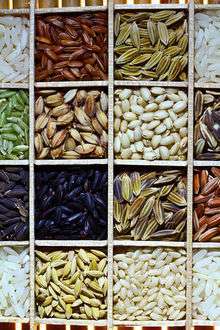 The identity of the five grains has varied over time, with different authors identifying different grains or even categories of grains. 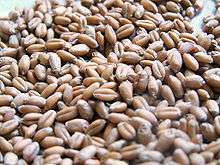 The name is typically translated as the "Five Grains" or the "Five Cereals", and less often as the "Five Sacred Grains" or "Crops". Some context is important to understanding the concept, however. First, this use of "five" predates modern botanical notions and is better understood as part of the symbolic use of numbers in Chinese culture. From a very early date, Han culture understood the world as composed of five elements and many corresponding pentads were ennumerated, including the Five Directions (south, north, west, east, and center), the Five Colors (red, black, white, qing, and yellow), and the Five Tones (a pentatonic scale). Second, the character 谷 consists of water (水) coming from (or creating) an opening (口) and also means (and originally meant) "valley". This sense of "food grown in the valleys" is rather broader than most of 谷's English translations and permits the Five "Grains" to sometimes include such members as soybeans and hemp. Within Chinese culture, the idea of 谷 includes many domesticated seeds and is distinguished from fruits (果), vegetables (菜), herbs (草), and wild plant foods. The sense of holiness or sacredness regarding the Five Grains proceeds from their traditional ascription to the saintly rulers credited for creating China's civilization. They were seen not merely as five crops chosen from many options but as the source permitting agrarian society and civilization itself. "Squandering the Five Grains" was seen as a sin worthy of torment in Diyu, the Chinese hell. As the position of emperor was seen as an embodiment of this society, one's behavior towards the Five Grains could take on political meaning: as a protest against the overthrow of the Shang Dynasty by the Zhou, Boyi and Shuqi ostentatiously refused to eat the Five Grains. Such rejections of the grains for political reasons underwent a complex development into the concept of bigu, the esoteric Taoist practice of achieving immortality by avoiding certain foods. Shennong ploughing fields in a mural painting from the Han dynasty. Shennong (神农) (lit. "Divine Farmer") was a Chinese culture hero credited with the development of agriculture. 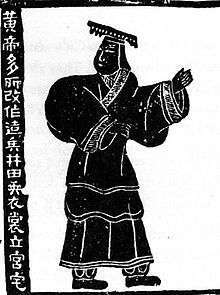 He was often conflated with Yandi (the "Flaming Emperor") and is also sometimes described as the Wugu Xiandi or "Emperor of the Five Grains". Sima Qian's chronology placed him around 2737–2699 BC. Then he found a seed of millet. And he went to open up a wasteland. And from then on humans were able to eat millet. The seed was hiding in grasses. And he went to open up a paddy field. And from then on humans were able to eat rice. And left it with the plum tree. He planted it one time. and was able to grow in infertile fields. So it was difficult for Shennong to get its seeds. And later tofu was able to be made south of the Huai River. Shennong was pleased that he got two seeds of them. Then later people were able to eat pastry food. He left the seed with brambles. Then later people were able to fry dishes in sesame oil. Because they were helped by the six species of trees. Huangdi (lit. 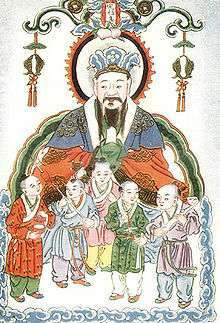 "Yellow Emperor"), placed 2699–2588 BC by Sima Qian, was also credited in ancient texts as the first teacher of cultivation to his subjects. Houji (lit. "Lord Millet") is sometimes credited with the original provision of millet from heaven to mankind and sometimes credited with its exemplary cultivation. Lord Millet was a title bestowed upon this figure by King Tang, founder of the Shang dynasty, and may have been an early position in the Chinese government. He was later worshipped as one of the patron gods of abundant harvests, like Lai Cho. In northern China, the Nanzhuangtou culture on the middle Yellow River around Hebei (c. 8500–7700 BC) had grinding tools. The Xinglongwa culture in eastern Inner Mongolia (c. 6200–5400 BC) ate millet, possibly from agriculture. The Dadiwan culture along the upper Yellow River (c. 5800–5400 BC) also ate millet. By the Yangshao culture (c. 5000–3000 BC), the peoples of the Yellow River were growing millet extensively, along with some barley, rice, and vegetables; wove hemp and silk, which indicates some form of sericulture; but may have been limited to migratory slash and burn farming methods. The Longshan culture (c. 3000–2000 BC) displays more advanced sericulture and definite cities. In southern China, the Pengtoushan culture on the Yangtze River (c. 7500–6100 BC) has left rice farming tools at some locations, though not at the type site. The Hemudu culture around Hangzhou Bay south of the Yangtze (c. 5000–4500 BC) certainly cultivated rice. The various people (such as Baiyue) who succeeded to these areas were later conquered and culturally assimilated by the northern Chinese dynasties during the historical period. 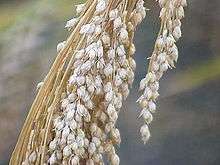 The Karuo culture (c. 3300–2000 BC) may have introduced agriculture into Tibet, where they cultivated foxtail millet. There are various versions of which five crops (or even broad categories of crops) are meant by this list. The Five Grains traditionally date back to the Shennong Ben Cao Jing, reputed to be a record of an oral tradition first delivered by Shennong himself. The Classic of Rites compiled by Confucius in the 6th and 5th centuries BC lists soybeans (豆), wheat (麦), broomcorn (黍), foxtail millet (稷), and hemp. Another version replaces hemp with rice (稻). The Hei'anzhuan cited above lists millet, rice, the adzuki bean, the soybean, barley and wheat together, and sesame as the "five" grains. The Tang-era Buddhist master Daoxuan's Ritual of Measuring and Handling Light and Heavy Property (量處輕重儀, Liangchu Qingzhong Yi) instead lists five categories: "house" grain (房穀), "loose" grain (散穀), "horn" grain (角穀), "beard" grain (芒穀), and "cart" grain (房穀). Huilin (慧琳)'s Pronunciation and Meaning of All Scriptures (一切經音義, Yiqiejing Yinyi (Huilin)) cites Yang Chengtian (陽承天)'s Assembly of Characters (字統, Zitong) as describing similar categories: suigu, sangu, jiaogu, qigu, and shugu. One modern Chinese dictionary notes other candidates including sesame, barley, oats, and peas. Assortments of five grains continue to be used in ritual contexts, as in the Min Nan custom of creating a Taoist stove to cook Chui Zhao Fan, a meal for the Kitchen God in which five dry seeds are placed into a slot in the chimney of the stove. 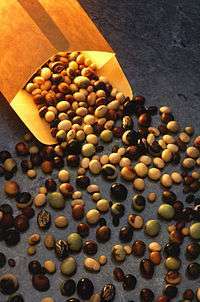 Casual worshippers may simply use any five beans (e.g., of different colors) instead of any particular set of grains. Chinese cuisine is not known for any single recipe using all five grains, so there is no grain equivalent of five-spice powder or "eight treasure rice" (八寶飯, babaofan). Many, perhaps most, Chinese cooking employs the grains in some fashion, though: rice, congee, noodles, spring rolls, breads, tofu, wontons and other dumplings as dishes; sweet bean paste as fillings; glutinous rice as a wrapping, for example in zongzis; rice and soy milks and beverages; soy sauces and sesame oils; and fermentation starters for use in beers, rice wines, and native liquors like baijiu. ↑ Baxter, Bill. "Middle Chinese readings for 9000 Guangyun characters", p. 40 Archived June 28, 2013, at the Wayback Machine.. 7 Aug 2006. Accessed 11 Aug 2013. ↑ Yang Lihui & al. Handbook of Chinese Mythology, p. 197. Oxford University Press, 2008. Accessed 11 Aug 2013. 1 2 China Culture. "Hou Ji". ↑ Roberts. Chinese Mythology A to Z, p. 70. 2009. 1 2 Chen Huaiyu. A Buddhist Classification of Animals and Plants in Early Tang China. 2005. Alan Davidson, Tom Jaine, The Oxford companion to food, p. 305, article on "five grains of China"